positive › Buy Poster of Laughing positive good-looking guy dressed in light blue shirt over gray t-shirt showing stop gesture, asking to stop joking, as he is tired of laughing. Young man with stylish haircut broadly smiling at camera and gesturing. 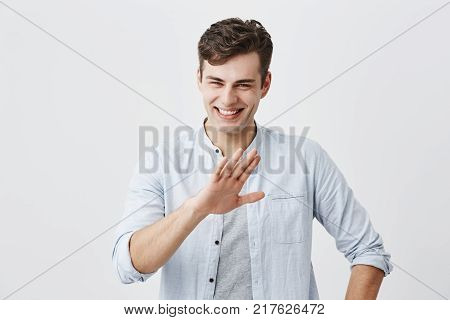 Poster of Laughing positive good-looking guy dressed in light blue shirt over gray t-shirt showing stop gesture, asking to stop joking, as he is tired of laughing. Young man with stylish haircut broadly smiling at camera and gesturing.